Foreword (G. Millot). Introduction to the study of green marine clays. Part A. The oolitic ironstone facies. Chamosite, the green marine clay from Chamoson (M.F. Delaloye, G.S. Odin). Green marine clays from the oolitic ironstone facies (G.S. Odin et al). Part B. The verdine facies. The verdine facies from the lagoon off New Caledonia (G.S. Odin). The verdine facies from the Senegalese continental shelf (G.S. Odin, J.P. Masse). The verdine facies off French Guiana (G.S. Odin et al). The verdine facies deposits identified in 1988 (G.S. Odin et al). Mineralogy of the verdine facies (G.S. Odin et al). Geological significance of the verdine facies (G.S. Odin, B.K. Sen Gupta). Part C. The glaucony facies. Glaucony from the Gulf of Guinea (G.S. Odin). Glaucony from the margin off northwestern Spain (G.S. Odin, M. Lamboy). Glaucony from the Kerguelen Plateau (G.S. Odin, F. Fröhlich). Geological significance of the glaucony facies (G.S. Odin, P.D. Fullagar). Part D. The celadonite-bearing facies. Nature and geological significance of celadonite (G.S. Odin et al). Conclusion to the study of green marine clays. Glossary. References. Index of collaborators. Geographical index. Green Marine Clays provides a comparative study of four authigenic marine clays: the well-known glaucony marine facies; the newly-identified sedimentary facies - verdine; the old oolitic ironstone facies; and the celadonite-bearing facies. The book demonstrates that the sea bottom plays host to a variety of clay minerals specific to the marine environment: ferric di-trioctahedral serpentine'', ferric chlorite, ferric smectite, ferric mica, ferricswelling chlorite'', all widespread in present oceans and all fundamentally formed by crystal growth and recrystallization processes in semi-confined marine microenvironments. 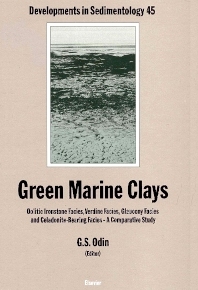 A unique feature of the book is the inclusion of the first detailed study of the verdine facies characterized by a variety of authigenic green clays, some of which are new clay mineral species widespread in all tropical oceans. The celadonite-bearing facies has been studied intensively in the last few years and new results are obtained from deep sea samples and from land outcrops. The current knowledge is synthesized and reviewed in comparison with the glaucony facies. A new approach is adopted in the description of the old oolitic ironstone facies in which a comparison is made with the recent verdine facies. The material is abundantly illustrated throughout by 133 figures and 59 tables; 36 of the figures consist of plates showing 170 selected pictures obtained at different scales of observation including the field, binocular microscope, thin sections, transmission electron miscroscopy, scanning electron microscopy, high resolution transmission electron microscopy, X-ray diffraction. A subject index completes the book. The information presented here will help geologists construct a clearer picture of environmental and depositional history of rocks. It will appeal to sedimentologists interested in the processes by which, and the environment in which, clay minerals form. Clay mineralogists will find much useful information on a variety of iron rich minerals, and geochemists interested in the iron in the sea and those working with sedimentary iron ores will also benefit from the book.